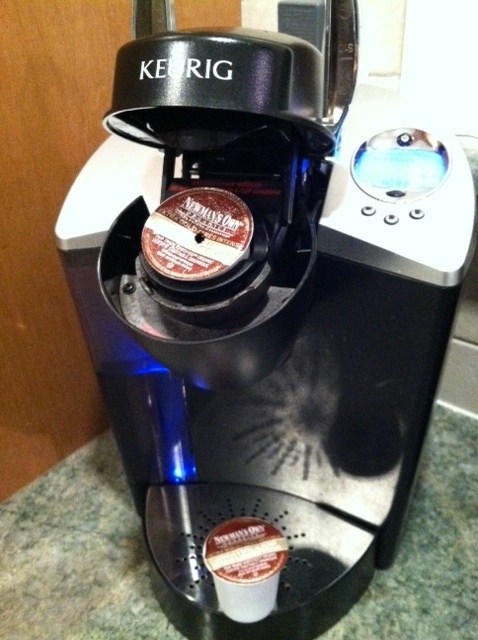 Love my coffee, love my K-cup? A good recycler like myself should not purchase single-serve individually packaged anything. Yet, we have a Keurig coffee machine that uses single-serve coffee units called K-cups. We got the Keurig machine about two-years ago. Prior to that we used to grind our own fair-trade, certified organic, shade grown, locally roasted beans. We used paper filters and had a conventional 12-cup coffee maker. This was practical for us on the weekends, but the idea of weekday convenience prevailed and the Keurig entered our lives. We buy the little coffee cups in bulk because it’s cheaper per cup (so there’s a plus with reduction in packaging) and the cardboard boxes they come in are recyclable (another small victory). I also prefer to get the fair-trade, certified organic coffee varieties whenever possible. Even though we are wasting a lot less coffee than before, those k-cups are now part of our daily waste stream. According to Keurig’s website they are looking into how they can make a recyclable k-cup and still maintain the coffee quality. They do make a reusable filter so you don’t have to buy k-cups at all, but it is a bit of a hassle to use. It gets too hot to re-use right away and it’s just plain messy getting the grounds out… But enough with trying to justify the convenience. I am on The Rubbish Diet. It is time to stop complaining and start making my coffee making habits as waste free as possible. This entry was posted in The Rubbish Diet and tagged Coffee, convenience, packaging, The Rubbish Diet. Bookmark the permalink. 3 Responses to Love my coffee, love my K-cup?